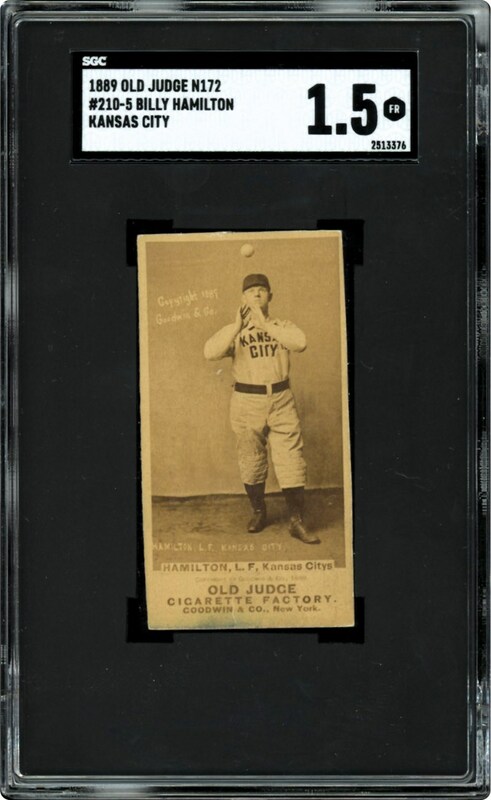 This 1889 Old Judge SGC 20/1.5 Billy Hamilton offering stands as one of his scarcer Old Judge subjects. Portraying his "210-5 Catch, Hands Neck High" pose (as outlined in the "Photographic Baseball Cards of Goodwin & Company" publication), the highlight of this 130-year old relic is the breathtaking image that atypically reveals the finest possible contrast and clarity imaginable for any N172 subject! Hall of Fame outfielder Billy Hamilton ended his illustrious career with an outstanding .344 lifetime batting average, and is one of only three players in baseball history to accumulate more runs scored than games played, including an unfathomable 196 in 1894. It was that fabled season that he would be part of a record-setting outfield that would all eclipse the .400 batting mark (Ed Delahanty .405; Billy Hamilton .403 and Sam Thompson .415)! Arguably, he was the finest all-around player of the 1890's, leading the league in stolen bases on seven different occasions, as well as leading the league in batting in both 1891 and 1893. AS previously mentioned, his classic sepia pose portrays one of the finest Old Judge images extant, with its crystal-like resolution and virtually perfect contrast the major attraction of this seemingly timeless keepsake. No doubt, with no major surface blemishes evident, the critical obverse side emanates solid mid-grade aesthetics, with the technical assessment solely due to back damage that includes a piece of tape and soiling. 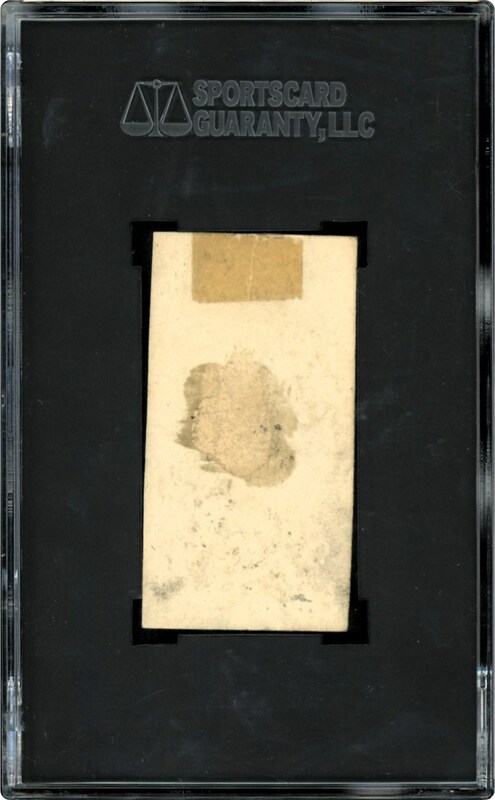 Regardless, as most 19th century purists surly realize, it is the front side central image that captivates the collector, with the any verso related issues and associated technical grades rendered virtually irrelevant with regard to the iconic N172 issue. That said, we cannot imagine a more aesthetically pleasing gem of "Sliding Billy" than this spectacular heirloom that offers the finest possible front side eye appeal for any Old Judge artifact!